We offer private wine tours at our partner wineries around the country, using a team led by our in-house sommelier, Eylon Bart. 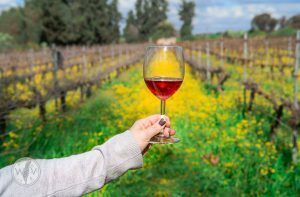 Tours feature intimate visits to Israel’s top wineries and wine destinations, allowing guests to taste plenty of wine and meet the key influencers of contemporary Israeli wine culture. Tours leave from both Jerusalem and Tel Aviv, and can accommodate groups of 5-15 people. Meet at hotel or pickup point and drive to winery (as decided before) in the Jerusalem area. Upon arrival, guests will be welcomed by the winery owners or winemakers, who will lead a behind-the-scenes tour and wine tasting. After the tour and tasting, guests will be taken by car to a beautiful nearby viewpoint, where they will learn more about Israeli wine and history from a Wine on the Vine staff member. Each guest will receive a bottle of wine to take home, from one of our top partner wineries. Transportation to and from hotel/pickup point will be provided for all guests. A longer, more in-depth journey into the history and culture surrounding Israeli wine. The tour begins at a winery, where guests will be welcomed by the owners or winemakers on staff, who will lead a behind-the-scenes tour and a special wine and local, boutique cheese tasting. After the tour and tasting, guests will be hosted for lunch at the winery or at a nearby restaurant. Following lunch, guests will enjoy a professional wine tasting workshop in Ben Shemen Forest by our in-house sommelier, Eylon Bart. This package includes visits to two of Israel’s most high-tiered wineries. Guests will meet the winery owners and winemakers who will lead them through the history of the winery, the winemaking process, and their vision for the future of Israeli wine. Each tour will conclude with a special tasting of each winery’s top offerings along with local, boutique Israeli cheeses. Following the tasting, guests will be taken by car to visit a beautiful and historical viewpoint, where our in-house sommelier Eylon Bart will lead a short workshop on the area and its influence on Israeli wine. Guests will then enjoy lunch at a nearby restaurant. The last stop will be at Red and White Wine Bar in Jerusalem, for a special wine workshop. Each guest will receive a bottle of wine to take home from one of our top-end boutique wineries. Transport to and from hotel/pickup point will be provided for all guests. After the tour and tasting, guests will be taken by car to a beautiful nearby viewpoint, where they will learn more about Israeli wine history and culture from a Wine on the Vine staff member. Same as Standard package, plus private wine tasting at Wine on the Vine’s rooftop HQ penthouse in Jaffa. The day begins with a short walking tour of Old Jaffa/Shuk HaPishpashim. The next stop is a chosen winery (as decided before), where guests will be welcomed by the owners or winemakers on staff, who will lead a behind-the-scenes tour and a special wine and local, boutique cheese tasting. Following lunch, guests will enjoy an intimate wine tasting workshop at Wine on the Vine’s rooftop HQ penthouse in Jaffa led by a WOTV staff member. This package includes visits to two of Israel’s most high-tiered wineries. Guests will meet the winery owners and winemakers who will lead them through the history of the winery, the winemaking process, and their vision for the future of Israeli wine. The tour will conclude with a special tasting of each winery’s top offerings along with local, boutique Israeli cheeses. Following the tasting, guests will be taken by car to visit a beautiful nearby viewpoint, where Wine on the Vine’s in-house sommelier Eylon Bart will lead a short, interactive talk on the area and its influence on Israeli wine. Following lunch, guests will have the option to visit Wine on the Vine’s rooftop HQ penthouse in Jaffa for a special wine workshop or take a night tour of Old Jaffa/Shuk HaPishPashim.